If we to pick a top 5 best carry luggage list, this would be at or near the top. The Briggs & Riley Baseline Domestic spinner is simply one of the best quality travel bags of carry on size that you can buy. But let’s get into the details of why we love it so much. This has got to be simply the best carry on luggage you can find. Briggs & Riley hit it out of the park with their superb design, smart features and unmatched quality inside and out. This is truly a piece of luggage that will still be kicking decades from now. We can’t find another manufacturer that makes bags to such an exacting quality standard. Briggs & Riley have been top of the pack for decades and haven’t cut corners on anything. From quality nylon, aluminum and rubber, to some of the best stitching and zippers we have seen on a bag, the quality is amazing. The durability on this bag is nothing short of miraculous. You can safely check the B&R Baseline carry on and not worry about scuffing, ripping or crushing. This can’t be said for many other similar sized bags. Briggs & Riley were the first manufacturer to introduce outside mounted pull handles. This allows the bag to be completely flat in the inside, allowing much more space inside and less wrinkly clothes. It’s funny that we don’t see any other manufacturers mimicking this game-changing idea. The Baseline Domestic carry on features an impressive external compression system to make sure your gear fits as snuggly as possible inside the bag. This essentially means that you can over-pack slightly but still compress the whole bag to airline standard size to fit in the overhead bin. And every cubic inch counts when you are taking only a single bag for a business trip. For business travelers, the bag has a top of class built-in garment carrier for carrying suits and jackets without wrinkling. The double spinner wheels (four of them) are the best in the business and will glide smoothly on most floors. This will help a lot on short airport transfers where you need to move fast and efficiently. In terms of storage, the bag offers an impressive 55.6 litres of space inside. This is pretty amazing when you consider that this bag is still regulation carry on size for the US. If you need something a bit smaller for international regulations, consider the Baseline International version. 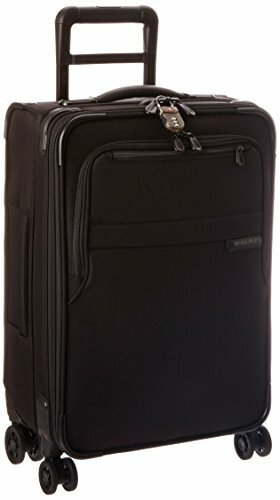 Briggs & Riley Baseline Domestic spinner is part of our list of the best luggage for international travel. This means it is in our minds in the very best company in terms of carry on luggage. This bag is not cheap. In fact, you are probably spending almost a third more money than many competing bags. However, no other carry on bag offers the same level of quality and durability. Briggs & Riley offers one of the only bag warranties that will actually cover airline damage to the bag. This is how much they believe in their product. Sure, it’s a bit more money, but you’ll recoup that considering this bag will last for literally decades before needing any replacement. If you want the best of the best carry on bag available, yes. This bag will last a long time and outperform anything out there. If the price is too steep, consider something more like the TravelPro MaxLite 4. If you’re interested in a great hard shell carry on bag from Briggs & Riley, consider the excellent (and damn near indestructible) Torq Spinner. I agree 100%. Simply nothing touches the quality and warranty support of the Briggs & Riley bags.